block M quilts: Is it worth it to block a quilt? And will it actually work? That question was in my head for about three months. I was debating with myself whether to leave the quilt as distorted as it was and just live with it or try to go the extra mile and block it. After my 'Purple Haze' quilt won 1st place in the international entries of the 'quilt top only category' in this year's Pantone Quilt Challenge I was very eager to start quilting it. I noticed some fabric shifting during the process but did not expect the outcome of it to be that bad! In the space of 15.5" the quilt was out of shape for almost 1". That continued to be about 4.5" by the end of the quilt (see first photo above, quilt folded in half). I'd never have such a distorted quilt. I asked the quilting community for some advice as to why this happened. 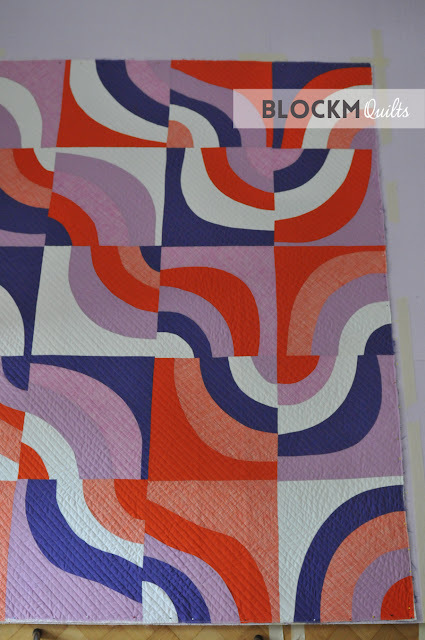 Curved blocks apparently are a bit tricky and are prone for fabric shifting during the quilting process. I didn't know that, that's the first curved quilt I've made. And on top of it I opted for diagonal straight quilting lines... bad combination. Deadlines are always a good motivator. 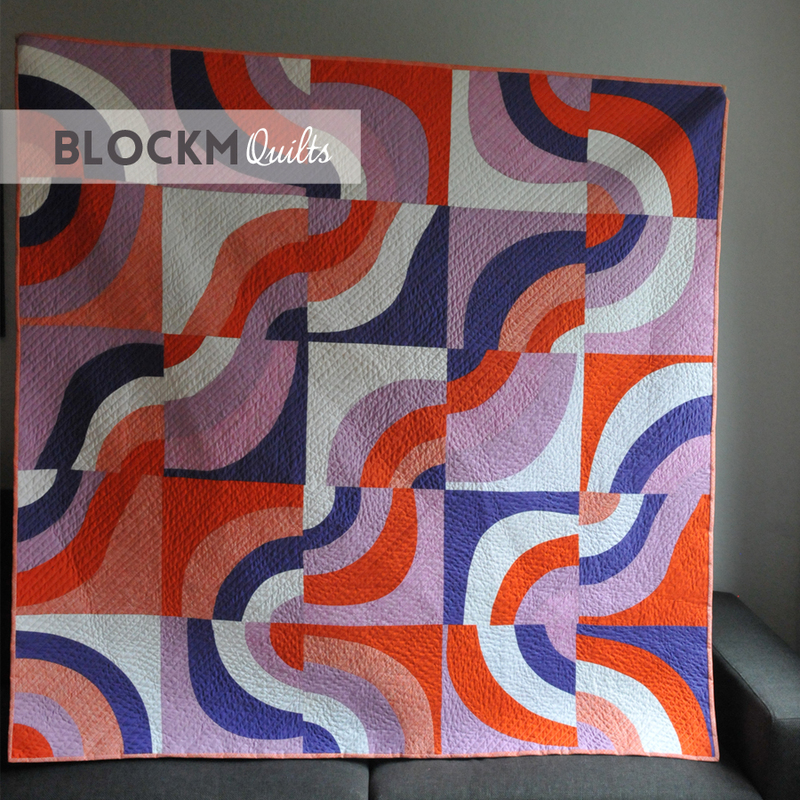 As I've seen that the Bloggers Quilt Festival is due I just decided to give blocking a go. I've watched a good few tutorials and people used their carpet for blocking quilts. Since we only have timber floors I used my recently purchased insulation boards as base to pin the quilt into. 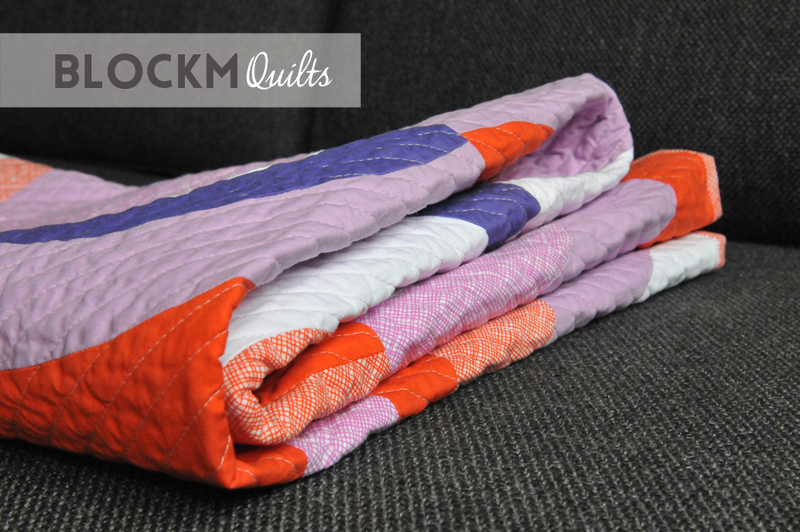 By coincident the boards have a lovely lilac colour that suited the quilt very well. The boards are actually to become my new design wall, I still need some flannel to cover them. But first the question: do I bind before or after the blocking process? And what will happen with my quilt when I wash it without the binding? I have heard that people blocked their quilts with and without the binding and had equally good results. Since my quilt was so badly distorted I decided to wash the quilt without the binding but sewed along all edges to secure the quilting stitches beforehand. I washed the quilt in the washing machine for a bout 10 minutes at a very gentle cycle and only put the spin on for about 30sec. I was so afraid that the quilting would rip apart but it was all good. Some people put the quilt in the bathtub, I guess that works as well. It actually wasn't that difficult to pull the quilt into shape. I used the perfect 90degree angle of the boards as a guide and started pinning the quilt in place. I marked the boards with tape to indicate the shape the quilt should have and left the quilt in place for 1.5 days to dry out. I'm so happy now with this quilt! I just applied the binding today and will make this a last minute entry into the Bloggers Quilt Festival. Unfortunately we have terrible rainy weather here today so I could only take indoor photos. I'm planning to take better photos outside and will do another blog post soon. But here it is, nice and square! The result is better than expected. The quilt still is not perfectly square but I am totally happy with the way it turned out. Before I blocked the quilt I had asked some quilty friends: so what happens with that blocked quilt when I wash it again? Will it loose it's shape again? Do I need to pull it into shape every time I wash it? 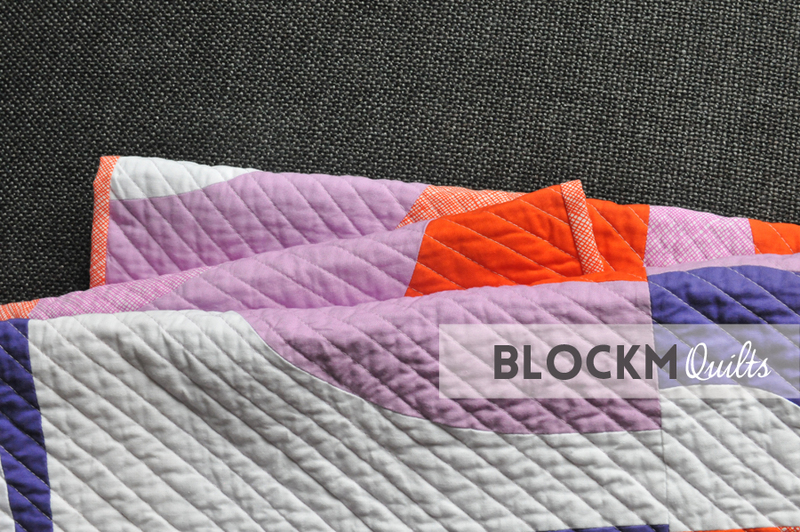 Most people only block their quilts when it's a wall hanging quilt or to be issued for a show and basically never to be washed again, so no one really could answer that. If you have some experience with that please leave a comment! I think I'll hang 'Purple Haze' up for a bit and enjoy these happy colours and I guess time will tell how the shape behaves after washing again. So was it worth it to block the quilt? Definitely yes! Did it work? Surprisingly yes! Will I do it again? 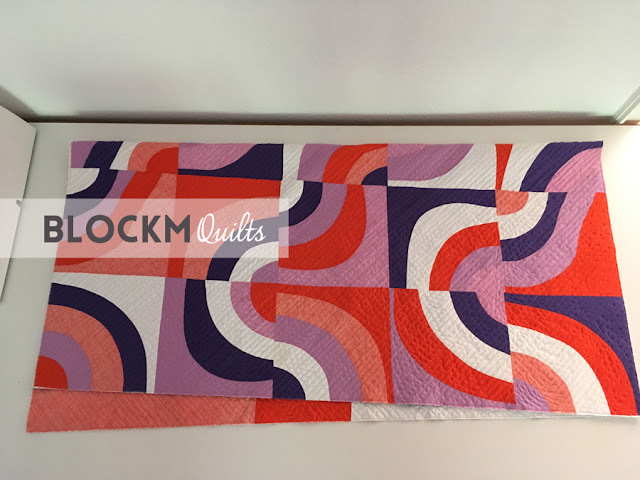 Well, I hope this doesn't happen that often but yes, I would definitely block a quilt again and next time I'm not waiting three months to do it! I'm linking to the Bloggers Quilt Festival hosted by Amy Ellis. Go and see some amazing quilts! This is a beautiful quilt! I just recently blocked my first quilt and did it much like you, only I didn't really wash it. I just got it quite wet before "stretching it into submission." :-) I think I like the idea of actually washing it better because I did have to re-block it after it's first washing. It wasn't too terribly out of square, but it was enough that I wanted to make it right again. I'm thinking that the actual washing will help with that. Your question makes me want to wash it, even though it doesn't need it, just to find out what happens. 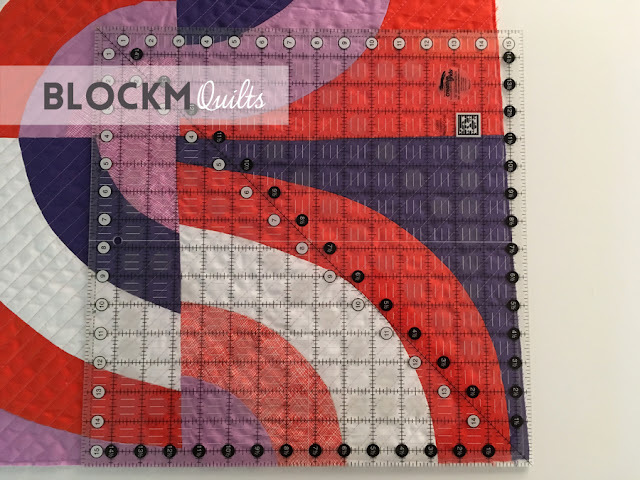 Love your quilt and the information about blocking a quilt. Take care, Mary. 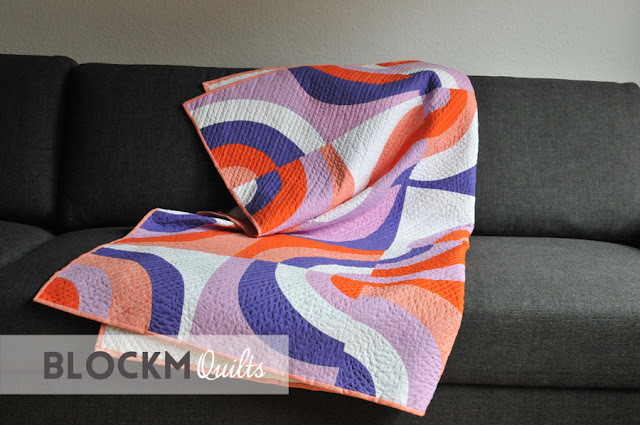 Well it's a beautiful quilt and I'm glad your blocking was successful. I've wondered too - what about the next time you washed it? 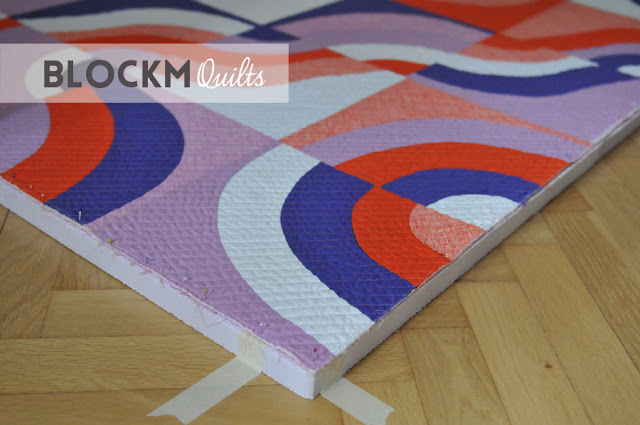 I was worried if the damp quilt harmed your wallboards for your design wall as I put a damp quilt on mine the other day and they warped. oops. 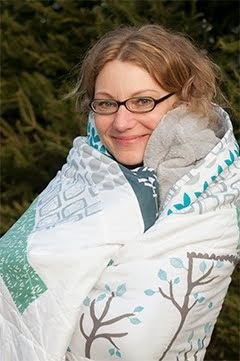 Anyway, glad your quilt came out well - it's a stunner! This is a gorgeous quilt! I am so glad that the blocking worked well. I occasionally block quilts that I am sending to shows, so I have never needed to wash them afterwards. I will look forward to hearing how that ultimately works out when the time comes for the first wash! Really pretty. I'm amazed how you squared it! It's a terrific finish. I am glad this worked out! No idea about the after another wash part, but very curious :) Please keep us informed. Glad this worked out for you! It’s so beautiful! I appreciate that you have shared this experience! I LOVE your Purple Haze quilt. Thanks for sharing your experience in blocking the quilt.